Florida’s population growth is squeezing its signature crop. Will oranges survive? After other local businesses have closed and employees are headed home to make dinner, Vic Story Jr. drives in the dusk to check the irrigation system for a row of tangerine trees. He recently had the grove replanted with a variety called bingo. They better tolerate a devastating disease called citrus greening, but they die back a lot, he said. 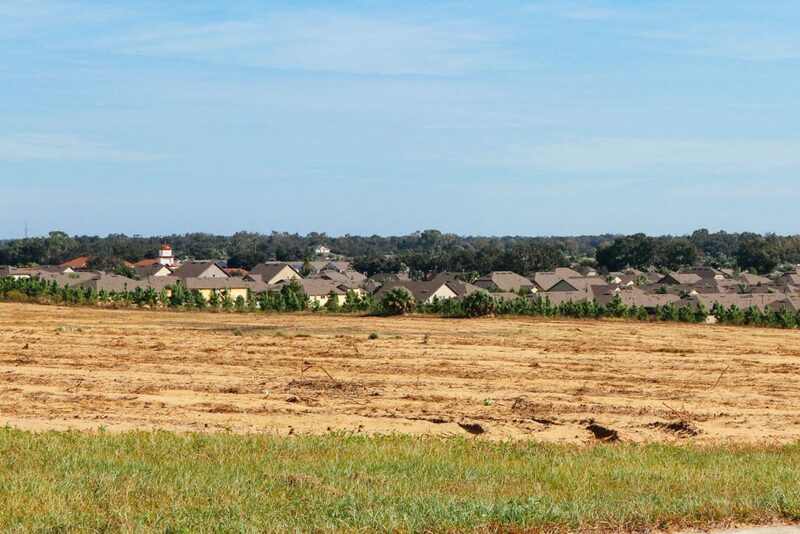 A 100-acre subdivision in central Florida presses against the parcel of land, one of the Story Companies’ many groves bordering a residential area. Story’s workers spray the groves five or six times a year. Drift from the air blast sprayers usually doesn’t pose a problem, but next to a neighborhood, they take special care to mist only on nights when the wind is blowing from the east. They’ve erected a barrier of trees in the eucalyptus family as a wall on the grove’s edge. “It requires a lot of extra management on our part that we’re good neighbors,” Story said. Tractors, mowers and fertilizer sprayers that sidle into public roadways bottleneck traffic. The sound and stench of sprayers peeves your everyday Floridian. Moreover, the groves look increasingly ripe for developers. They’re already near roads, towns and the places people work. Mix that with the conflicts between agriculture and neighborhoods, toss in a pestilence-mongering insect and you have an industry primed for paving. A plot of land that was once citrus trees sits next to a new housing development near Haines City. Photograph by Sarah Stanley. Frank Hunt III of Hunt Bros. Inc. in Lake Wales said the company has sold peripheral plots to development, and he’s watched other growers sell out as urban Florida unfurls. You might think the tensions would steer developers away from agricultural areas. But Garrett said much of the time they want to avoid the pricier city centers in favor of the cheaper outskirts closer to ag. The bleeding of homeland into farmland is made possible in part by psyllids, the sap-sucking citrus pest from southeast Asia. The bugs coasted from Brazil to Florida in 2005, probably wafted inland by the hurricanes the previous year, Spreen said. Unrestrained by predators, the bugs carried a fatal bacterial disease called Huanglongbing (HLB), commonly known as greening, from tree to tree as they noshed on leaves and branches. Symptoms of the disease crop up slowly. By the time growers knew their trees had succumbed, it was too late. 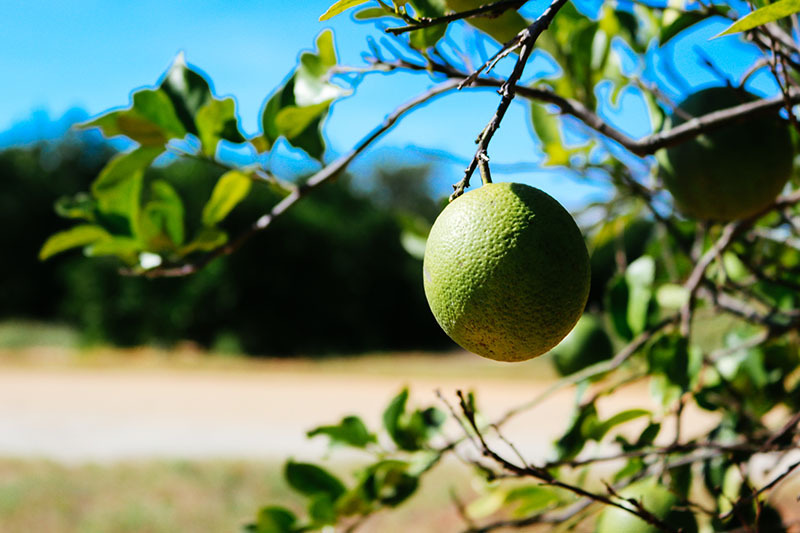 “Part of what makes HLB so insidious is if a mature tree is visited by a psyllid carrying the bacteria, it will not begin to express symptoms of the disease for as long as two years after it’s been infected,” Spreen said. The trees can have a lifespan of 30-50 years, and it might take 10 before the tree is no longer viable, Spreen said. The U.S. Department of Agriculture and research institutes have worked on possible solutions ranging from the simple system of bagging young trees to implanting a spinach gene into crops to augment their immunity. 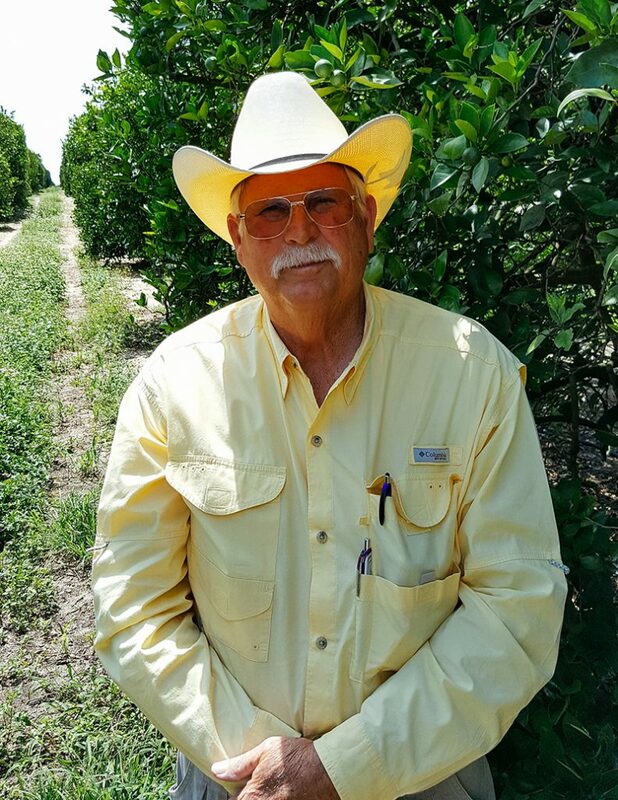 — Florida citrus grower Vic Story Jr. But the slow growth of trees and uncertainty about new crops’ sustainability leaves growers without long-term solutions, Hunt said. “Sir Lancelot hasn’t come riding in on a white horse and given us the holy grail yet,” Spreen said. In the meantime, grove owners are losing planted acres. Hunt Bros. manages about 6,600 acres, less than three quarters of that planted. Of the planted acreage, some hasn’t matured to fruit-bearing age, likely due to greening. Story said his company is facing similar loss, down to 4,500 managed acres from about 7,000. An unripe orange on the edge of the Hunt Bros. packinghouse in Lake Wales. Photograph by Sarah Stanley. after Hurricane Irma in 2017. Hunt Bros. production began to decline in 2012 after a harvest of 1.9 million boxes. That sum steadily swirled down to 900,000 in 2016-17. Last year, Irma left them with only 500,000 boxes. The last impacts to hit citrus as hard as greening were the 1980s freezes that decimated both young and old trees in the state. “You could make an argument that Orlando would not have exploded in the way that it had had it not been for the freezes in the 1980s that destroyed thousands of acres of citrus,” Spreen said. Similarly, HLB-related yield loss was at 41 percent in 2016, according to a survey of 76 growers by IFAS. Story said citrus predators he saw in his 20s like nematodes, foot rot and blight still affect groves today. He thinks greening will go down as another challenge the industry overcame. Converting crops to rooftops, and all the concrete that entails, also means less water soaking back down into Florida’s aquifer, Garrett said. Sprawling town squares, roads and parking lots that stretch for acres reduce the area for rainfall and drainage. Garrett sees the swap of land from groves to development as a menace to Florida’s ecosystems and water supply. She said too many environmentalists vilify fossil fuels when the endless paving over of Florida poses a truer challenge to the state. For one, development bulldozes the trees that cycle moisture back into the air through transpiration. Additionally, roadways connecting homes and industrial quarters create heat sinks – the so-called “heat island effect,” which warms up towns. Humans need more green spaces, she said, but they sure aren’t prioritizing it in land-use decisions. 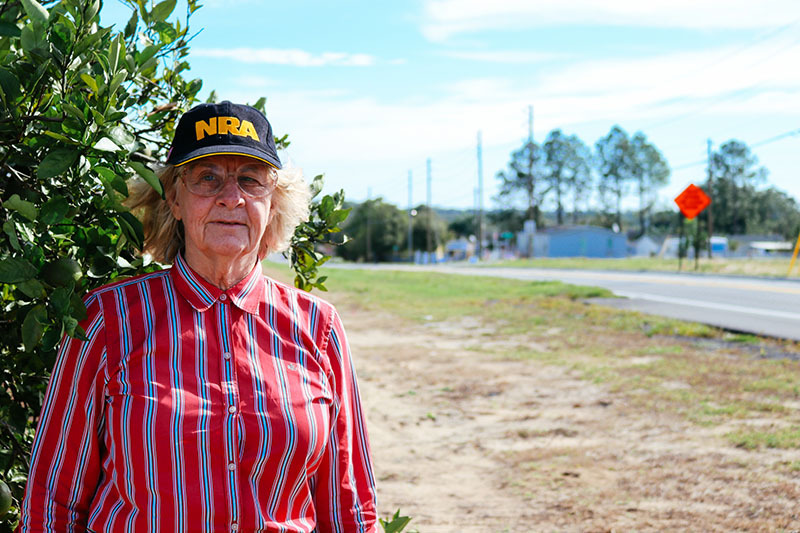 “I used to hate to see the woods plowed up for groves,” said Haines City grower Sharon Garrett. “Now I hate to see the grove plowed up for houses.” Photograph by Sarah Stanley. Bob Norberg, who worked with the Florida Department of Citrus as Deputy Executive Director of Research, said he believes people will realize their impact and self-correct. Hunt and Story also have hope that Floridians will reach a balancing point as more people call the state home. The Citrus Research and Development Foundation has poured more than $120 million into greening research efforts since 2010. Still, greening decimates crops and drains funds for its mitigation. Short of selling their groves, growers must increase the cost of their products to cover the costs. Norberg said increased prices for your morning OJ, coupled with the fallback in production, has led to a massive closure of packing houses. In the 2010-11 season, 52 packing houses boxed citrus in Florida. The 2017-18 data show a cutback to 18, not all operating at full capacity, said Marisa Zansler, Director of Economic and Market Research at the Florida Department of Citrus. Without that framework to support the industry, Florida citrus experts say it could collapse. Hunt said Florida is building up its coastlines excessively and needs better growth management practices. Solving citrus’ challenges and the penchant for paving green spaces requires both involvement in local politics and a commitment to maintaining a domestic food supply. If people don’t care about citrus for food security or the environment, Garrett said, they should at least care about the economic impact of agriculture. 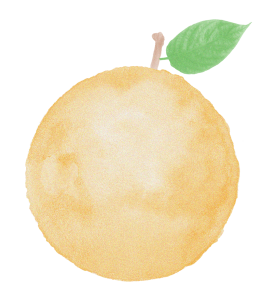 Spreen agreed, saying citrus provides jobs and supports local government through taxes. Before greening, the industry had a $10 billion impact on Florida. That decreased to $8.6 billion in the 2016-17 season, but Zansler said that number is expected to rise again. “There are some areas of Florida that are economically disadvantaged by a rapid decline in citrus,” Zansler said, referring to areas such as Polk and Highlands counties where tourists and their spending are sparse. Spreen also said Floridians should maintain their backyard citrus, which played a role in citrus canker and may also disperse greening. “If it’s infected, you know, shed a tear and cut it down,” he said. Norberg believes Floridians have come to the aid of the industry with strong support for research efforts. Short of buying 10 gallons of orange juice a week, the best way to preserve the state’s citrus heritage is to continue to express a desire for a balanced environment.